Dr. Ho grew up in San Francisco, California and received his medical degree from Georgetown University. He completed his residency training and Sports Medicine fellowship at Virginia Commonwealth University (VCU) Fairfax Family Practice, where he worked closely with several professional and collegiate organizations including the Washington Redskins, the DC Divas, the Washington Glory, the US Military Academy at West Point, and the Naval Academy in Annapolis. Dr. Ho has served as a Team Physician for the Washington Bayhawks Professional Lacrosse Team, and is currently a Team Physician for the Potomac Nationals MiLB Baseball Team, DC Divas Professional Football Team, George Mason University, and Briar Woods High School. 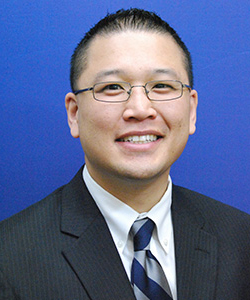 Dr. Ho is also the Medical Director of the Fairfax County Public School System’s Athletic Training Program. He also regularly volunteers in the medical tent at major sporting events, such as the World Police and Fire Games, the Marine Corps Marathon and the Army Ten-Miler. Dr. Ho’s published works include several book chapters and journal articles, including 100 Questions & Answers About Your Sports Injury, a sports medicine reference for patient-athletes, parents, and coaches. Dr. Ho is a Board Certified Family Physician with a Certificate of Added Qualification in Sports Medicine, and additional credentialing in Musculoskeletal Ultrasound, and the management of Concussions and other Traumatic Brain Injury. Dr. Ho has special interests in running medicine, martial arts and combative sports, mechanical peripheral neuropathies, regenerative injection therapies, office procedures, concussion management, point-of-care sonography, preventative medicine, and academic medicine.